More than 500 oak species grace the planet, united in the genus Quercus. The oak species vary in size and appearance, and also in lifespans. Under ideal conditions, some species of oak tree live 150 years or more, but short-lived varieties die after about 50 to 60 years. Individual lifespans also depend on environmental conditions, pests and diseases, and commercial development. Oak trees can grow as tall and wide as 80 feet. Many oak trees live longer than 150 years, although few reach the age of one southern live oak (Quercus virginiana) in Louisiana, which American Forests, a conservation organization, estimates to be 1,500 years old. Beside southern live oak, large and long-lived oak varieties include holly oak (Quercus ilex), which like southern like oak is hardy in U.S. Department of Agriculture plant hardiness zones 7 through 10; canyon live oak (Quercus chrysolepis, USDA zones 8 through 10); and valley oak (Quercus lobata, USDA zones 7 through 9). For oak trees, 50 years counts as short-lived. A native of the southeastern United States, laurel oak (Quercus laurifolia) lives 50 to 60 years and grows to about 65 feet tall. 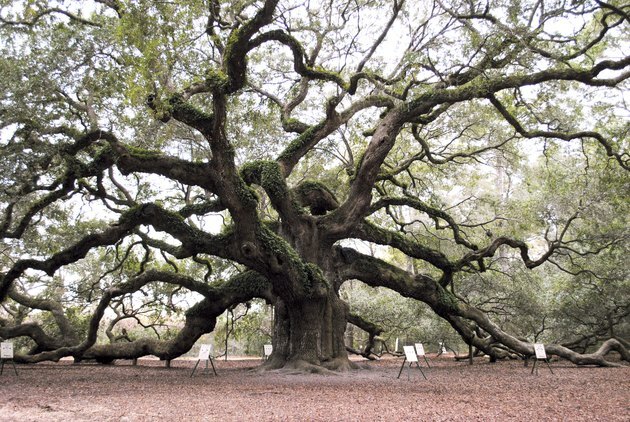 Also native to the Southeast, water oak (Quercus nigra) reaches 60 to 80 feet tall and lives 30 to 50 years. Laurel oak and water oak are hardy in USDA zones 6 through 10. Planting an oak tree variety that thrives in your USDA zone helps ensure that the tree lives a long and healthy life. All oak species grow best in sites with full-sun exposure, but different varieties have different watering needs. Oaks from dry-summer areas, such as valley oak, need no watering during winter after they've been in their location for six or seven years. Species native to wet climates, such as water oak, require watering during winter. Compacted soil, changes to your yard's grade or overwatering can kill your oak tree. The oak may take close to 10 years before succumbing to such pressures, but it will begin to decline, and you may not be able to save it once you notice its thinning canopy or dying leaves. If your oak bleeds sap that has a strong odor, then the tree may be infected with a pathogenic disease called sudden oak death, which may kill the tree within weeks to two years. The disease is incurable and can spread to other susceptible plants if you don't remove the affected tree from your yard.